How quickly times can change for an NBA franchise. One minute you’re competing on the NBA’s biggest stage for an NBA championship, the next minute you’re looking into the future with the hopes your newly-acquired young talent can develop to a point where someday you can find yourself on that big stage again. This has been the case for the Cleveland Cavaliers this offseason, who find themselves in a peculiar position after the departure of superstar LeBron James. The kid from Akron swapped Ohio for Hollywood in an attempt to add another illustrious chapter to his already legendary career. In doing so, James left the Cavs in a puzzling position, with a question mark over their direction, future, and roster moving forward. As James boarded a plane to head to Los Angeles, it left not only the organization but also the players already on the roster in an unfamiliar place they hadn’t experienced in the four years he was there — not knowing what their role would be moving forward. With the addition of youngster Sam Dekker earlier today, it has become even more unclear what the situation will be like for this upcoming season and beyond. The Cavaliers did re-sign Kevin Love in what looked like an attempt to stay competitive. This could be true, or did they do it purely to increase his trade value down the line as he’s surely going to put up great numbers as a number one option on offense to raise his stock again. 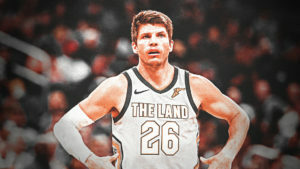 They are exploring trades for Kyle Korver, they want to extend Larry Nance Jr, they’ve brought in Channing Frye, Cedi Osman is projected to start, and George Hill may be on his way out in just a few drastic decisions that will change the course of the franchise. All in all, the roster is still very much up in the air. The biggest individual that may have been impacted by James’ departure, however, is shooting guard J.R. Smith, who may find himself without any playing time.
. @clevelanddotcom's @joevardon on #Cavs shooting guard J.R. Smith (1/6) – "I haven’t talked to Tyronn Lue about this yet so we’re kind of guessing here, but the roster was already taking shape to where you wondered how much playing time J.R. was going to get…"
. @clevelanddotcom's @joevardon on #Cavs' J.R. Smith (2/6) – "…Because you could see a scenario where either George Hill & Collin Sexton start together or you could see Sexton, Rodney Hood, & Cedi Osman start together. Hill, Cedi & Hood could start…"
. @clevelanddotcom's @joevardon on #Cavs' J.R. Smith (3/6) – "…Of those 4 players, you could see 3 of them starting and none of them are named J.R. In the second unit, you’ve got Clarkson, Korver, Tristan – I’m assuming Nance Jr. starts – Channing, and Zizic…"
. @clevelanddotcom's @joevardon on #Cavs' J.R. Smith (4/6) – "…So then J.R. is in there somewhere. If he gets back to being the player he was a couple years ago, then yeah, you can start talking about him moving farther up the depth chart…"
Smith was always a player that thrived alongside James, as his role was concise and simple. James always took Smith under his wing and made sure he was accommodated and believed in. He also played a part in Smith signing a lucrative extension which he’s unfortunately never lived up to. With James gone and Smith fresh off his NBA Finals Game 1 meltdown at the end of regulation, it’s hard to see how the Cavs will fit in the veteran this upcoming season. They may be wise to offload him elsewhere in an attempt to free up cap space and get younger for the future. They have explored trade scenarios but nothing has transpired as of yet.